Earlier this year, Tecsun released its long-awaited newest large portable: the Tecsun S-8800 portable shortwave/LW/AM-MW/FM receiver. Though I fully intended to buy a Tecsun S-8800 for review, our friendly Hong Kong-based Tecsun retailer, Anon-Co, sent an S-8800 to me before I could. I’ve worked with Anna at Anon-Co for at least a decade and have purchased numerous radios for review, not to mention as gifts for family and friends. When she insisted to send it as a gift, I decided I would (gratefully) accept the unit. I received the S-8800 on February 1 and promptly posted unboxing photos here on the SWLing Post. My new Tecsun S-8800 had a serious problem, though––one that two early S-8800e adopters noticed as well––internally generated noises, also known as birdies. And while most receivers will have a few minor birdies scattered across the bands, this S-8800 hosted a whole chorus of them, overwhelming the bands and making use of the radio difficult. Read through this post thread for details. I contacted Anna at Anon-Co and she immediately notified Tecsun; as a result, they halted distribution of the S-8800. Tecsun took the S-8800 to their engineering team, and I’m happy to report they’ve now eliminated the horrible warbling DSP birdies of the initial unit I received. On the S-8800s since released, while there are still a few minor birdies across the bands (more on that later), they’re merely what one might expect to find on any receiver. In short, the S-8800 now in production is a functional receiver, and a contender in its class. I’ve had the S-8800 for a few weeks now and have had time to put it through its paces. What I present now is a review of the re-engineered Tecsun S-8800. In the spirit of full disclosure, I must note that I’m not as avid a user of large portables like the S-8800. Personally, my preference is for smaller, full-featured travel-friendly portables, or else larger tabletop models. I travel often and like to pack lightly, so I rarely reach for anything bigger than my trusty Sony ICF-SW7600GR, or Tecsun PL-880, and more often than not, I grab the ultra-compact Sony ICF-SW100 or C. Crane CC Skywave. But to say that I never reach for large portables would be inaccurate. In fact, I use a Grundig GS350DL daily; it’s my analog kitchen radio. I rarely move the tuning dial (a good thing, since it unfortunately drifts) because it’s locked onto my in-house SSTran AM transmitter on 1570 kHz. What large format portables like the GS350DL and S-8800 can provide that a small portable cannot is broad, rich, room-filling audio. In my world, good audio is an important factor in overall signal intelligibility. The S-8800 chassis resembles several other receivers: the Grundig GS350DL, S450DLX, and more recently, the Field BT, just to name a few. The body is made of a hard plastic (not rubberized) and feels rugged enough. The knobs and buttons also feel tactile and of comparable quality to the previous similar models noted above. With the rechargeable batteries inserted, it weighs about 3 pounds 4 ounces (1.5 KG). The backlit display is large and viewable from almost any angle––even at a distance. The main encoder (tuning knob) has appropriate amount of brake for most listeners. It wobbles very slightly, but functions amazingly well. I prefer it over its large portable predecessors, especially the 350GL. There is no soft mute while tuning, so band-scanning is a fluid, almost analog, process. Both the “Band Select” and “AM BW” knobs have soft detents that mark steps in selection. In the field, I noticed that these can occasionally skip an increment when the detent only moves one position or the knob is turned very slowly. This doesn’t really affect functionality in any way, but I thought it worth noting nonetheless. Like previous similar models, the S-8800 lacks a built-in keypad for direct frequency entry. That would be a major negative for a radio in this price class if the S-8800 didn’t come with one invaluable accessory: an infrared remote control. The Tecsun S-8800 ships with a IR remote control, and as far as I’m concerned, it’s great. But more importantly, the remote works quite well. The controls are intuitive and the labeled buttons are quite easy to read. They’re also tactile and have a muted “click” response when pressed. Indeed, I wish my television’s remote was this well designed. And the remote is quite useful, especially if you like listening from bed, from a porch, from the kitchen or dining room or den––or, in fact, from any space where you might wish to control the receiver at a distance. I believe its possible that every function of the S-8800 can be controlled with the remote––even the sleep timer! Perhaps my dream remote for such a purpose would be backlit, but the S-8800’s remote is so simple to use, I’ve already nearly memorized where the buttons are located for nighttime use. The S-8800 ships with an informative operational manual, although this radio is intuitive enough that a seasoned radio listener will not need to reference it, save for advanced settings. Still, it’s written in clear language––with comparatively few English grammar errors––and the diagrams for both the radio and the remote are exceptional. I referenced the manual several times to sort out ATS operation, saving/erasing memories, and to hunt down function shortcuts. Wishlist? The S-8800 feature set is pretty comprehensive, but my dream large portable would also have synchronous detection and an RF gain control, though the latter is not common in the world of portable radios. Fortunately, the S-8800 does have a local/DX gain toggle. I’m sure some enthusiasts would also like to see Bluetooth connectivity as on the Eton Field BT, but I personally don’t miss it. I like to keep my HF portables free from anything that could potentially raise the noise floor. With the exception of synchronous detection, the S-8800 has a solid, comprehensive tool set. Over the past two weeks, I’ve had the S-8800 on the air almost every day. I’ve compared it with a number of receivers, but mainly its smaller sibling, the popular Tecsun PL-880. Below, I break down my notes by band. As is typical with my shortwave portable reviews, I spent less time evaluating FM performance on the S-8800. With that said, I did compare the S-8800 with the PL-880, PL-680 and CountyComm GP5-SSB and a few other portables. The S-8800 found my benchmark weaker broadcasters with ease. I’ve had more inquiries about S-8800 mediumwave performance than I’ve had about any other radio I’ve recently reviewed. Why? Well, for one thing, some radios in this particular portable format perform quite well on mediumwave––the C.Crane CCRadio-SW, for example, comes to mind. Also, the S-8800’s large front-facing speaker lends itself to superb AM audio. Unfortunately, mediumwave is not the Tecsun S-8800’s strong suit. I did extensive testing, comparing it with much smaller portables: the Tecsun PL-880, the Sony ICF-SW7600GR, the Digitech AR-1780, the CC Skywave, and even a pre-production CC Skywave SSB. All of these portables had better sensitivity on mediumwave. To reiterate from my previous post, comparing any modern radio with the Panasonic RF-2200 on mediumwave is hardly fair. For one, the RF-2200 has been out of production for a few decades. For another, the RF-2200 has a large rotatable ferrite bar antenna that provides excellent gain. The RF-2200 simply wipes the floor with all of my modern portables, as their ferrite bar antennas are but a fraction of the size. To my ear, the S-8800’s mediumwave band seems noisier than its competitors. Perhaps this is why it struggles with marginally weak stations. With that said, when tuned to a local AM broadcaster, the S-8800 really shines. It produces rich audio which can be customized with bass/treble tone controls and by changing the AM filter width. I also hooked up the S-8800 to my large horizontal loop antenna. This certainly did improve MW reception, but not as dramatically as I hoped. Additionally, it seemed to be very sensitive to RFI in my shack even when hooked up to the external antenna. If you took the S-8800 to the field, added a decent inductively-coupled magnetic loop antenna, no doubt it would improve mediumwave reception, but I still doubt it would come close to the RF-2200 in performance. As long as I own the latter, I wouldn’t be motivated to do so. Due to my schedule over the past few weeks, I’ve had precious little time to test the S-8800 on mediumwave at night, but some quick air checks proved performance was consistent with daytime testing. I am pleased to report that no receiver overloading was observable during testing. In short: if you’re only considering the S-8800 for mediumwave DXing, you should look elsewhere. I would suggest a dedicated AM broadcast receiver like the excellent CCradio 2E, a vintage Panasonic RF-2200, or perhaps a used GE Superadio. I’ve spent less time on longwave than I have on mediumwave and shortwave. With that said, the S-8800 was able to receive our local airport beacons at night with relative ease. I was not able to catch any transatlantic longwave broadcasters, but that’s no surprise as it’s almost impossible on even my commercial-grade receivers during the summer months here in North America. As I said regarding the mediumwave band, I suspect there are much better radios out there for the longwave enthusiast. 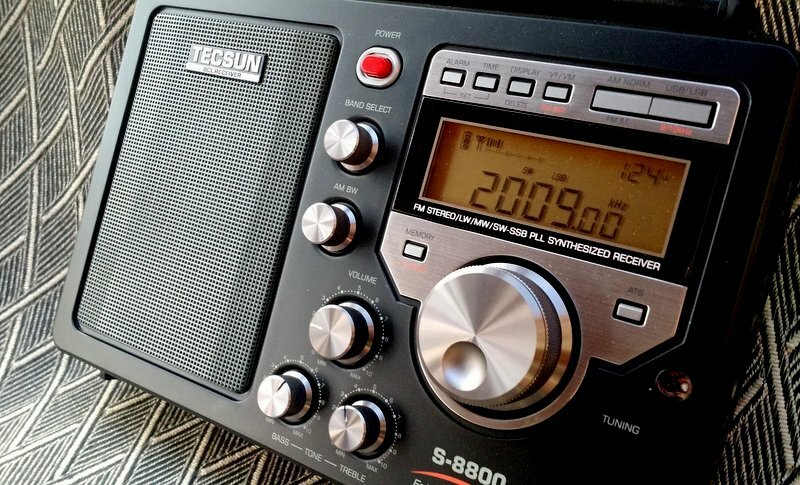 At the end of the day, I believe the Tecsun S-8800 was designed with the shortwave and amateur HF radio enthusiast in mind. The S-8800 has gapless HF coverage from 1,711 kHz to 29,999 kHz, can be used both in AM or Single Sideband (selectable LSB/USB), and has adjustable bandwidth filters tailored to AM broadcast and SSB/CW (ham radio/utility/pirate) reception. The filter widths are well-chosen for each mode: 6, 4, 3, and 2.3 kHz on AM; 4, 3, 2.3, 1.2, and 0.5 kHz on SSB. It also has a dedicated fine-tuning control that adjusts steps based on the mode. All of these are desired features for the HF radio enthusiast. I’m happy to report that the S-8800 is a very capable shortwave receiver, perhaps even one of the best portables currently on the market. In every comparison test I made on shortwave, the S-8800 outperformed each of its competitors. I was pleasantly surprised by the audio in SSB mode and by how well the filters seem to work. Note in the video the warbling sound as I adjust the fine-tuning control on the S-8800. But it’s actually only present as I adjust the fine-tuning control; I noticed no stability issue once on frequency. Since the S-8800 has a handy standard BNC connector and high impedance AM antenna socket on the back, I hooked it up to my large horizontal loop. In my testing, it handled that antenna’s gain very well and I was most impressed with the performance. The front end seems to be robust, and selectivity––which is excellent––was not compromised by my antenna. I was able to pull apart two broadcasts with only 5 kHz of separation that were both quite strong. The S-8800 locked onto the stronger of the two stations with ease. When tuned to the weaker station, I used SSB reception on the upper sideband to ignore the noisier lower sideband which was buried in the adjacent signal. Once I zero-beated the signal, it sounded quite good. Perhaps what the S-8800 has going for it on shortwave is a combination of very good sensitivity, excellent selectivity, and a feature all too often overlooked: good audio fidelity (via the internal two-watt speaker). The AGC (auto gain control) is actually fairly stable on the HF bands (less so on mediumwave). Like the Tecsun PL-880, the AGC has a soft hiss response when the signal fades below the AGC threshold. While I’m not crazy about this, I must confess that it is pretty easy on the ears when fading is pervasive. I did note one quirk that could annoy those wishing to copy narrow SSB or CW. If the filter bandwidth is set to .5 kHz and you’re listening to a marginal CW signal, the AGC sometimes mutes the receiver during CW dead space. It equates to very unstable audio with audio levels jumping around wildly. This happened more often when I was copying moderate to weak CW signals. I’ve even noticed it when listening to SSB ham radio conversations, but mostly in the narrow bandwidths. I usually keep the filter set to 2.3 kHz or higher and it hasn’t been a problem at these settings. It’s worth noting that I have observed the same AGC behavior in my PL-880 at times. The S-8800 ships with two rechargeable lithium cells which provide hours of listening time from a full charge. I never encountered overloading from local AM broadcasters on the shortwave bands, with the caveat that I never tested the S-8800 in an RF-rich urban market. One thing I have noticed in general about the S-8800 is that it seems pretty sensitive to RFI indoors (electrical noise in the home, office, etc)––more so than my Sony ICF-SW7600GR, for example. If you live in a noisy environment and never plan to use an external antenna or take the radio outdoors, you might think twice about the S-8800. I spent one afternoon carefully mapping out all of the birdies I could find across the longwave, mediumwave and shortwave bands. As you can see, there are no birdies in the middle of sensitive areas like broadcast bands, amateur radio bands, etc. A good report, in my book. Note that while tuning through the shortwave bands, I used 5 kHz steps. I suppose there’s a possibility I might have missed very weak birdies doing this, but any strong birdies would have been received and noted within the 5 kHz window. On LW and MW, I tuned in 1 kHz increments. As I’ve already mentioned, if your primary use of the S-8800 is for mediumwave or longwave DXing, you should look elsewhere. While the S-8800 will serve you well with local AM stations, it will not dig signals out of the noise like other better-equipped AM receivers. The GE Super Radio, Panasonic RF-2200, or CCRadio 2E are much better options. But if you’re primarily a shortwave radio listener––? I think you’ll be pleased with the S-8800. I did not mention this in previous posts, but the first S-8800 I received in January––the one with the birdie-chorus problem––also outperformed my other modern portables on shortwave. In part, I feared that when the Tecsun engineers addressed the birdie issue, it could have a negative impact on overall sensitivity. I’m happy to report that it did not. What’s more, I realize that larger portables do have a place in my life. You might have noted that I did all of my review testing and preparation outdoors, mostly in a nearby national park. I do this, in part, to insure I’m far away from any RFI, but also I simply love playing radio outdoors. Only yesterday, Anon-Co announced the price of the Tecun S-8800: $268 US with free shipping to the US. I understand that the S-8800e is being sold in Europe for 339 Euro, roughly $400 USD, plus shipping. There is no way I’d pay that price; it’s simply too much. If the price exceeds $300 US, I’d suggest careful consideration, as the S-8800 price would be venturing into the realm of used Sony and Panasonic benchmark portables. But. If this radio should be sold for less than $250, or even $200…? Being primarily a shortwave radio listener, I would certainly buy this radio for that price. In the end, the price is $18 higher than the $250 I mentioned in my review draft, but I assumed shipping would be tacked on to that price. So $268 ended up being pretty close to the mark. So I believe the Tecsun S-8800 hovers at the top price threshold of what most radio enthusiasts would be willing to pay for a portable. 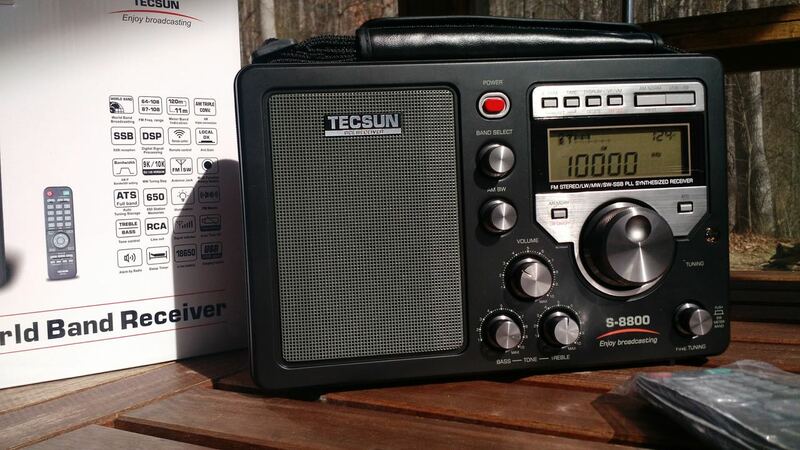 At $268, it’s over $100 more than the excellent PL-880 and only $20 less than the Tecsun S-2000. And for radio enthusiasts outside the US, it sounds like shipping will be added to the $268 price. I expect European consumers will pay a premium due to embedded (and required) sales tax and customs handling fees. Click here to view at Anon-Co. Nonetheless, I would still consider purchasing at the $268 US mark because of its shortwave performance, ability to connect external antennas, audio fidelity, and the included IR remote control. I would like to see the price lower than $268. If the price were nearer the $200 mark, it would be a no-brainer––this radio would likely fly off the shelves, and I’d strongly suggest purchasing. Perhaps, with time, the S-8800 price will decrease. In the meantime, if you have the budget, I believe the S-8800 would make for a nice field companion, pulling weak DX out of the noise with excellent audio fidelity to boot. It’s already been a great field companion for me…and, I’m sure, will accompany me into the field again. This entry was posted in AM, DX, FM, Ham Radio, Mediumwave, New Products, News, Radios, Shortwave Radio, Shortwave Radio Reviews and tagged Reviews, S-8800, Shortwave Radio Reviews, Tecsun, Tecsun S-8800, Tecsun S-8800 availability, Tecsun S-8800 review, Tecsun S-8800e on September 8, 2017 by Thomas.